Scholarships provide much needed financial support for our students. Every year, due to the generosity of WSU alumni and friends, we are able to award approximately $300,000 in scholarships. Endowed scholarships create a permanent legacy at the WSU College of Pharmacy and Pharmaceutical Sciences (CPPS) and can be created with a minimum investment of $25,000. Often endowments are established by families or friends in honor or memory of a loved one. Leon and Merrie Kay Alzola are both firmly committed to the profession of pharmacy and to the WSU College of Pharmacy and Pharmaceutical Sciences (CPPS). Leon, class of 1991, and Merrie Kay, class of 1993, met while students in pharmacy school and in 2017 they celebrated their 24th wedding anniversary. They established this scholarship to provide financial support to current WSU pharmacy students and encourage their leadership and involvement in professional pharmacy organizations. Both Leon and Merrie Kay have been involved at every level in national, state and local professional pharmacy associations. Leon and Merrie Kay are both Past Presidents of the Washington State Pharmacy Association, and continue to volunteer for WSPA. At WSU, Leon and Merrie Kay have helped implement the successful Fred Meyer Mentor Program, and both have mentored many future pharmacists. In addition, Merrie Kay serves as the chair of the Dean’s Advisory Council at the WSU CPPS, and both serve as Directors of the CougaRx Nation Pharmacy Alumni Community. Their love of WSU, the college, and mentoring pharmacy students, helped guide their decision to establish the Alzola Family Scholarship Endowment. The Carolyn Backstrom Scholarship Fund was set up in 2001 by Carolyn Backstrom, a 1934 pharmacy graduate who worked in pharmacy until retiring in 1977. The Arby and Cathaline Baker Scholarship in Pharmacy was established by their son, Danial Baker ’78, who credits them with giving him a strong work ethic and drive. Dr. Baker has been a faculty member at the WSU College of Pharmacy and Pharmaceutical Sciences since 1983. The David E. Bell Scholarship in Pharmacy was started in 2007 by David E. Bell of Lacey, Wash., a 1976 pharmacy graduate who has spent most of his career in hospital pharmacy. The Mabel E. Bement Scholarship was established in 1972 as an annual scholarship by the children of Mabel and Frank Bement: Reed Bement, a 1928 pharmacy graduate, Margaret Lehan, Betty Pence, and Ken Bement. This scholarship was established by Brenda S. Bray and Lisa Joanne Woodard out of their commitment to public health. Bray and Woodard were classmates at WSU and graduated together with their bachelor’s degrees in pharmacy in 1983. They obtained their master’s degrees in public health from the University of Washington in 1985. Today Bray and Woodard are on faculty at the WSU College of Pharmacy and Pharmaceutical Sciences. The recipient of this scholarship shall be a deserving second, third, or fourth year student pharmacist who has demonstrated a strong commitment to public health by promoting an improved quality of life, healthy development and healthy behaviors across all life stages. Dessie was born in 1924 and grew up in Roslyn, Washington, where her father worked in the coal mines. After her father died, the family moved to Wapato where Dessie met and was mentored by Janice Sourwine, a Wapato pharmacist. Dessie graduated from the WSC College of Pharmacy in 1947. She eventually got a job in Yakima and became the director of pharmacy at Yakima Valley Memorial Hospital, a position she held for 42 years. Dessie kept her pharmacy license until 2001. Dessie was a loyal Cougar and a devoted pharmacist. This scholarship was established through her estate when she passed away in December 2011. The distributions from this fund shall be used to award scholarships to one or more students in the Pharm.D. program. The Fred & Esther Burmaster Memorial Scholarship was established in their memory in 1987 by their daughter, Ruthe Ridder. Fred graduated from WSC with a pharmaceutical chemist degree in 1924 and a pharmacy degree in 1925, and was a WSU college instructor from 1925 to 1929. Esther got degrees in home economics and education in 1925. Professor Emeritus R. Keith Campbell has had a profound impact on hundreds of WSU pharmacy alumni. His reach extends beyond WSU and he has received numerous national awards for his leadership, mentorship and innovative practices in the profession of pharmacy. Many alumni and friends of the WSU College of Pharmacy and Pharmaceutical Sciences (CPPS) have asked about the potential to name a space in the Pharmaceutical and Biomedical Sciences Building to honor Keith’s legacy. At the 2017 Crimson Gala, occurring October 20, 2017, Keith Campbell received the WSU CPPS first-ever “Lifetime Achievement Award.” Funds raised will be used to name the Applied Patient Care Laboratory and the adjacent student study space in honor of Professor Emeritus R. Keith Campbell and his lifetime of service to WSU and the pharmacy profession. The Dahmen-Williams Memorial Scholarship was established in 1984 by the families and friends of Douglas Dahmen and Brian Williams, second-year pharmacy students who were killed in an auto accident. Gerry grew up in the small farming town of Plaza, Washington. He graduated from Plaza Grade School and Spangle High School. Gerry then received a Bachelor of Pharmacy degree from Washington State University. He worked for two years in retail pharmacy and then spent two years in the U.S. Public Health Service as a pharmacy officer. He received an MBA from Harvard Business School and then began his career with Eli Lilly and Company. Gerry retired from Eli Lilly after a long and very successful 33-year career. The Deary Sisters Scholarship was established in 1992 by Harry Johnson in honor of his wife Norma, and her three sisters – Mary Jo, Peggy and Marita – all of whom graduated from the WSC College of Pharmacy between 1948 and 1955. The Harvey Denton/ Ronald McDonald House Charities of Spokane Endowed Scholarship in Pharmacy was established in 2002, in part with a bequest from Harvey, a 1933 pharmacy graduate, and in part by the Ronald McDonald House Charities of Spokane. Harvey and his wife, Bertha, operated the Denton Drugstore in St. John, Wash., for 21 years. The Richard & Jacquelyne Doane Scholarship in Pharmacy was endowed in 2005 by Rick (1971 CPH) and Jacque Doane (1972 CAHNRS). Rick’s family has a long history with WSU as his father, uncle and two brothers are WSU pharmacy graduates and his sister is a nursing graduate. Jacque’s brother is a Ph.D. graduate from WSU’s College of Engineering. The Doanes established this scholarship to assist Pharmacy students in achieving their academic goals. Ron and Carol Doane both grew up in the Cashmere area. Following graduation from high school, Carol attended business college. She worked in Seattle during WWII, which Ron served with the 82nd Airborne and 28th Infantry division in Europe. Ron subsequently attended the WSU College of Pharmacy and Pharmaceutical Sciences (CPPS), while Carol worked until their first child was born. They had four children, three boys and one girl. The three boys are all graduates of the CPPS, and their daughter graduated from WSU College of Nursing. Ron practiced pharmacy for more than 40 years, and he and his brother Wayne were partners in Doane’s Valley Pharmacy in Cashmere for 21 years. The Morris Edward Ewell Scholarship was established in 1996 in memory of Morris Ewell ’31 by family and friends of Morrie. During his lifetime, Morrie was a practicing pharmacist in Spokane and the owner of Manito Pharmacy. His son, Edward Morris Ewell, is a 1959 pharmacy graduate. The Julia D. Flory Memorial Scholarship was established in 1987 by her daughter, Julia F. Vinson, in memory of the 1930 pharmacy graduate who worked as a licensed pharmacist until 1950 and encouraged many young women to study and realize their potential. The Donald R. Galpin Memorial Scholarship was established in 1985 by the family and friends of Donald Galpin, a faculty member at the college from 1966 to 1985, in recognition of his loyalty and service to the college. This endowment was established by Max’s widow, Nancy Garred. Max was a 1952 graduate of the pharmacy program at Washington State College. Nancy also graduated from the pharmacy program at Washington State College in 1959. They owned and operated Southgate Drug in Tumwater for approximately 20 years. As a second generation pharmacist, Greg is proud of his family history. He and his wife, Doris, are establishing this scholarship to create opportunities for future students to see pharmacy as a caring, personal career in an entrepreneurial environment. It is a career choice that allows an opportunity to be your own boss. The Margit Garthe Harrison Memorial Scholarship was established in 1996 by the estate of Margit and Charles Harrison. She was a 1939 WSC pharmacy graduate who practiced in Ketchikan, Alaska, and then at hospitals in Richland and Kennewick. This gift is established by Sherry D. Holland, ’75 College of Pharmacy and Pharmaceutical Sciences and her husband, Philip A. Krieter. The donors believe that increased participation of minority students benefits not only an individual student, but also the larger pharmacy community and the student’s community of origin. Diseases such as diabetes, hypertension and their sequela, particularly renal insufficiency, disproportionately affect certain communities. Health care providers from the community bring important understanding of the culture and traditions that are crucial to effective treatment of such diseases. It is important that the healing gifts of these students be appropriately developed and shared with others in the pharmacy community. In support of these aims, the donors established this endowment. Holly served as the NCPA president in 2009. She is co-owner and president of Rxtra Care, Inc., which operated three pharmacies in Seattle area. She also serves as a chair of the PSTAC, NIPCO and is a member of the NCPA’s political action committee. This scholarship will be used for the priorities of the College of Pharmacy and Pharmaceutical Sciences in regards to community pharmacy. The Barbara Higgins Memorial Scholarship in International Health Sciences was created by Dr. Robert W. Higgins ’57 in memory of his late wife, Barbara, who passed away in 2002. She was a 1956 WSU graduate in home economics. After graduation, Dr. Higgins worked as a pharmacist for five years before he went on and got his medical degree from the University of Washington. The Nelson L. Higgins Memorial Scholarship was established in 1990 in memory of Nelson L. Higgins by Peter W. Wood, and was endowed by Mr. Higgins’ son and daughter-in-law, Dr. Robert W. and Judy Higgins. Nelson Higgins earned a Ph.G. (Graduate Pharmacist) from WSC in 1925, and a B.S. in Pharmacy in 1926. He owned pharmacies in Uniontown and Pullman. His son is a 1957 WSU pharmacy graduate. The Walter & Hazel Hinman Foundation Scholarship was established in 1969 through the will of Walter Hinman, who became a pharmacist in the early 1900s through an apprentice program. He worked in Seattle and served as treasurer of the WSPA for more than 40 years. This endowment is established in memory of Lewis Clarke Hughes (‘23 Pharmacy) and Robert Lee Fisher (‘52 Pharmacy) and his wife, Shirley Hughes Fisher, daughter of Lewis Hughes (‘53 Pharmacy, University of Arizona). Lewis Hughes owned and operated Monarch Drug Company in Tacoma, Wash., while Bob and Shirley Fisher owned Fishers’ Pharmacy in Kennewick, Wash., and Crown Drug in Pasco, Wash. Because the family believes strongly in the importance of independent community pharmacy, they have established this endowment. It is their desire that not only the family legacy, but also the legacy of independent retail pharmacy will be perpetuated with this gift. The children of Robert and Shirley Fisher, Brad Fisher and Stacie Fisher Hamilton (also grandchildren of Lewis Hughes) are proud to establish this endowment in memory of their loved ones. Brad Fisher graduated from WSU in 1979 with a B.A. in business administration. His sister, Stacie Fisher Hamilton, also graduated from WSU in 1981 with a B.A. in business administration. Presently they both reside with their families in the Tri-Cities. The distributions from this fund shall be used to provide a scholarship for a WSU College of Pharmacy and Pharmaceutical Sciences (CPPS) student who has expressed an interest in independent community pharmacy. Selection will be made by the CPPS scholarship committee or at the discretion of the dean. The J. Bruce & Marian Hunter Memorial Scholarship was established in 1996 by Orville Johnson (a 1939 pharmacy graduate and family friend), Dr. Slonecker, and the daughters of J. Bruce Hunter and Marian Hunter. Bruce Hunter was a 1932 graduate of the College of Pharmacy and Pharmaceutical Sciences. The Immunex Scholarship Fund was established in 1994 and has been awarded to pharmacy students with an interest in cancer treatment or research. The Martin J. Jinks Memorial Scholarship was created by the Jinks family and friends and the faculty and staff of the College of Pharmacy and Pharmaceutical Sciences in memory of Marty Jinks, who was a faculty member and administrator at the college from 1978 until his death in 1996. The Irvin D. Johnson Endowed Scholarship is named for the 1932 pharmacy graduate who was a practicing pharmacist and pharmacy owner for about 20 years before he ventured into other businesses in Hood River, Oregon. He left the endowed scholarship as part of his estate when he passed away in 2006. The E.H. Jones Scholarship was established in 1988 by Edyrn H. Jones and his wife, Lucille. He was a 1940 WSC graduate in chemistry and a 1942 pharmacy graduate from State University of Iowa who then had a long and distinguished career in retail pharmacy in Washington State. The Muriel Jones Memorial Scholarship was established in 1999 by Maynard Jones in memory of his wife, Muriel, pharmacy class of 1948, who died in 1995. The Wilbur N. Joyner Memorial Scholarship was established in 1972 with a bequest from the estate of Wilbur Joyner’s wife, Nanette. Wilbur was a pioneer druggist in Spokane who established and operated four drugstores and the Physicians and Surgeons Supply Co. from 1908 to 1926. James P. Kehrer received a B.S. in pharmacy from Purdue University in 1974 and a Ph.D. in pharmacology/toxicology from the University of Iowa College of Medicine in 1978. He did postdoctoral work from 1978-1980 at Oak Ridge National Laboratory. In 1980, he was appointed to the faculty at the University of Texas at Austin. From 1991-2004 he was head of the Division of Pharmacology and Toxicology in the College of Pharmacy and from 2004-2005 he was director of the Center for Molecular and Cellular Toxicology. In 2005 he became the dean of the College of Pharmacy and Pharmaceutical Sciences (CPPS) at Washington State University, and from 2009 to 2016 he was dean of the faculty of pharmacy and pharmaceutical sciences at the University of Alberta. Dr. Kehrer served on numerous NIH grant review panels, as a member of the US-EPA Science Advisory Board Exposure and Human Health Committee, and on the US-FDA Nonprescription Drug Advisory Committee. He served as editor-in-chief of the international journal Toxicology Letters for 21 years. His research was in the areas of free radicals, oxidative stress, cell signaling and apoptosis. He received the Achievement Award from the Society of Toxicology, a Research Career Development Award from the National Institutes of Health, and is a fellow of the American Association for the Advancement of Sciences. He has published 150 papers and two books. Debra A. Kehrer married James in 1977 and received a B.S. in nursing from the University of Iowa later that year. They have two children and moved to Hayden, Idaho, in 2017 following James’ retirement from the University of Alberta. Funding for this scholarship came through the Paul C. Kehrer family foundation. Paul is James’ father. Paul spent his entire business career in Watertown, Wisconsin. He was president and CEO of Watertown Building and Loan beginning in 1945. That organization underwent several name changes becoming Watertown Savings and Loan, then First State Savings. After a merger in the late 1980s it became First Financial and after another merger in 1997 became Associated Bank which it remains today. Paul retired at the end of 1985 but continued on the board of directors until his death in 1996. After Paul’s death, the family decided to establish a family foundation with a focus on supporting education in various contexts. The Dorothy Otto Kennedy Scholarship was established in 1987 by Duff and Dorothy Kennedy, Mary and Jack Shuler, and Bruce and Faye Kennedy, in honor of their mother, Dorothy Otto Kennedy, a 1916 pharmacy graduate. Dorothy Kennedy who was head of pharmacy at Everett General Hospital in Everett, Wash., at the time she retired from the profession. This scholarship was established by Frank J. Kenney in memory of his wife, Janice Sourwine, a 1934 Washington State University graduate. Janice was devoted to pharmacy, loved her alma mater, and maintained a lifetime association promoting its interests and welfare. The recipient shall be women students enrolled in the College of Pharmacy and Pharmaceutical Sciences and in good academic standing. Primary consideration shall be given to students who have demonstrated need for financial assistance in furthering their education. The Don and Julia Lee Scholarship Fund was established in 1993 by Don to honor his wife Julia, who died in 1992. He was a Chinese emigrant who came to Pullman in 1928. After he and Julia were married, they owned Don’s Midway Grocery near campus, which was frequented by students. John G. Marshall, M.D. grew up near the small community of Snoqualmie and graduated from Mt. Si High School in 1965. He attended Washington State University and earned a degree from the College of Pharmacy and Pharmaceutical Sciences (CPPS) in 1970. He decided a pharmacy career was not the right path for him, and went on to earn a medical degree from the University of Washington in 1974. After completing a family practice residency at the University of Miami, he joined Group Health in 1977, where he spent his entire medical career. John and his wife, Julia, a class of 1965 WSU CPPS alumna, were married for 24 years prior to John’s death from cancer in 1998. Dr. Marshall is fondly remembered by his patients for his dedication to their health, as well as his humble nature. He is survived by Julia and their two children, Scott and Kate. The Charles Martin Memorial Scholarship was first awarded in 2001 and was established by Charles F. Martin’s family and former students from the College of Pharmacy and Pharmaceutical Sciences, where Martin was a faculty member from 1943 through 1980. Any and all contributions shall be designated to the College of Pharmacy and Pharmaceutical Sciences Dean’s Fund for Excellence. The Phyllis Clark McFadden Memorial Loan and Aid was established in 1972 through the will of her husband, Cyril E. McFadden. Phyllis McFadden was a 1925 WSC pharmacy graduate. The Abdel-Monem Endowed Scholarship in Pharmacy was established by the alumni and friends of the WSU College of Pharmacy and Pharmaceutical Sciences to recognize Monem Abdel-Monem, dean from 1987 to 1998. The Darold F. Niedermeyer Memorial Scholarship Fund was started in 2000 by Hi-School Pharmacy in Vancouver, Wash., to honor Darold Niedermeyer, a 1962 pharmacy graduate who worked at Hi-School for 21 years. The George Norin Scholarship was established by bequests from George and Iola Norin upon her death in 1998. George was a 1934 WSC pharmacy graduate. The Claire D. and Lawrence H. Norris Memorial Scholarship Endowment was established in 1991 by Claire D. Norris to honor Lawrence, a second generation pharmacist who graduated in 1951 from WSU. Norris owned Beall’s Rexall Drugs in Puyallup for 30 years before it was passed to his son William Mark Norris in 1992. William Mark is a 1976 pharmacy graduate. John Oftebro graduated from the College of Pharmacy and Pharmaceutical Sciences in ’65. John has experience in retail and hospital pharmacy and managing small apothecaries. John has been active in community and professional organizations. He is the past president of the Washington State Pharmacy Association and the American College of Apothecaries. John is the current president of Washington State Pharmacy Foundation. Bert Porter, class of 1950, established this fund to provide opportunities for WSU pharmacy students to attend professional conferences and conventions in order to give WSU students a competitive edge. Bert, who owned Porter Drugs at 5th and Thor in Spokane, Wash., believes that pharmacy students, as well as faculty, should be leaders in the pharmacy profession. Pharmacy students and their faculty mentors can have a direct impact on the future of the profession by getting involved in professional organizations, local pharmacy organizations and communicating with legislative professionals. Albert H., May A., and Walter A. Powell Pharmacy Scholarship was established by a bequest from May Leone Powell of Cheney, Wash., to honor the memory of her mother and father, May A., and Arthur H. Powell, and her brother Walter, who was a 1920 WSC pharmacy graduate. The Mark E. Preston Memorial Scholarship is named after a 1939 pharmacy grad. This scholarship is supported by Mark’s nieces and their families, Jane & Roger Bugbee and Dee and David Willms. Quality Food Centers (QFC) is a longtime Seattle grocery chain with a strong commitment to provide outstanding pharmacy services to our communities. 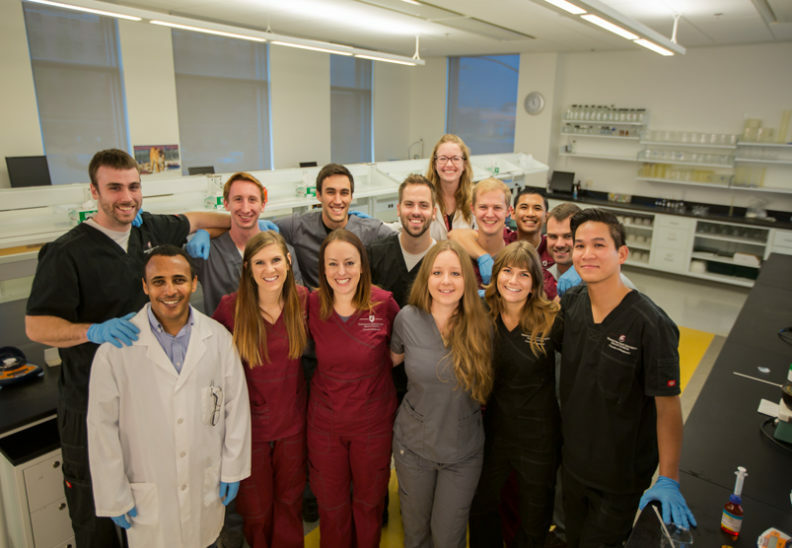 The Senior Management team has a desire to support both the WSU College of Pharmacy and Pharmaceutical Sciences as well as the impressive students within the program. With QFC’s commitment to providing high quality, nutritious food and a pharmacy program emphasizing superior customer service, it seemed only natural that QFC should help support pharmacy student scholarships at WSU. The distributions from this fund shall be used to provide one or more scholarships to pharmacy students. This endowment was established by the friends, colleagues and students of Larry Simonsmeier to continue his legacy with an annual scholarship in his name. Larry’s long time friends and students, Leon and Merrie Kay Alzola, were instrumental in creating this scholarship. The distributions from this fund shall be used to provide scholarships to students in the College of Pharmacy and Pharmaceutical Sciences professional program. Recipients shall be selected by the college scholarship committee on the basis of financial need and academic performance. Preference will be given to a fourth year student, who has received at least a “B” grade in pharmacy law, and is from a town with a population less than 10,000. Both John and Claudia Swenson attended WSU and feel that in many ways it set the course for their professional and personal lives. They met through a College of Pharmacy professor, Dr. Leslie Benet, and Claudia got her engagement ring on February 14, 1968, between classes on the 2nd floor of College Hall thanks to Dean White. In 2018 John and Claudia celebrated 50 years of marriage. John studied pharmacy and embarked on a career that has lasted almost 50 years. After a brief stint in the Navy, he planned to be a retail pharmacist. However, several clinical interactions at San Francisco Children’s Hospital and at Mary’s Help Hospital in Daly City changed his mind. He was an early leader in clinical pharmacy, publishing the first total parenteral nutrition protocol in the US at University of Washington Hospital. He then moved to Valley Medical Center where he set up an excellent clinical program, first as a clinical pharmacist as then as the Pharmacy Director. Claudia transferred from the WSU College of Pharmacy to the University of California Medical Center, School of Pharmacy, after they were married, in 1968 where she completed her Pharm.D. in 1971. Claudia’s passion has always been clinical pharmacy. She served as a hospital and clinic based pharmacy clinical coordinator for almost 20 years establishing inpatient services (antibiotic review team, dosing protocols for aminoglycosides/heparin) and outpatient services (anticoagulation clinics, home infusion therapies). Distributions from this Fund shall be used to award an annual scholarship to a pharmacy student(s) interested in patient-centered inpatient or outpatient pharmacy care, i.e. “clinical pharmacy”. Priority for this scholarship shall be given to 2nd, 3rd or 4th year pharmacy student(s) who are either (1) the first member of their immediate family to receive a 4 year college degree or (2) is the daughter, son or spouse of an active duty, retired or deceased member of the American Military or an Honorably Discharged member of the American Military. Elwyn & Viola Swetman Rx Scholarship was started in the 1940s by Mr. Swetmann as an annual contribution for scholarships. The scholarship was later endowed through a bequest from Viola T. Swetmann. This scholarship was established in 2008 by Deborah Tannehill, in memory of her mother Betty-Lee Tannehill, class of ’45. This scholarship is given to a pharmacy student with preference to those students in good academic standing in pharmacy who demonstrate interest in an independent, non-chain setting. Gary Thiemens Memorial Scholarship was established in 1994 by Kim Rieken and family in memory of this 1977 graduate who served as a president of the Spokane Pharmacists Association and was a member of the college’s Alumni Advisory Board. Both Marjorie and her husband Joe were leaders in the pharmacy industry here in the Spokane area. They established this scholarship in hopes that this will provide a stimulus to current students at the WSU College of Pharmacy and Pharmaceutical Sciences to look at the careers of Joe and Marjorie as models for professional and civic lives. This scholarship was established in honor of Marguerite Villars, a well-respected and well-known “pioneer” in the field of pharmacy. Marguerite was an anchor for the Spokane Pharmacy Association for over 50 years. Marguerite, a graduate of University of Washington School of Pharmacy, came to Spokane in the 1950s and was one of the first female pharmacists in the Inland Northwest. She served as a preceptor to hundreds of WSU College of Pharmacy and Pharmaceutical Sciences students for several decades. The Marguerite Villars/Spokane Pharmacy Association scholarship is a wonderful tribute to her legacy and lifetime of service to the pharmacy community in Spokane. Jessie Senora Sims Walker Scholarship was established in 1991 by Monem and Judy Abdel-Monem to honor the 1913 pharmacy graduate who was the first African-American graduate of Washington State College. She went on to a distinguished career as a pharmacist in Tacoma. This scholarship was established to honor Janet Ruth Warren, mother of Ian Warren, a 1989 graduate of the WSU College of Pharmacy and Pharmaceutical Sciences. Janet Ruth Warren had nine children, and raised seven of them as a single mother on one-income after her husband abandoned the family and refused to pay child support. Regardless of this daunting situation, Janet was determined that her family would not only stay intact, but that each of her children would attend college. Ian recalls becoming very hesitant about applying to WSU because he knew the financial strain it could put on the family. When his mother learned this, she said, “The Good Lord has gotten us this far, and he will get you to Pullman, Ian.” And he did. Ian went on to graduate, thanks to the foundation his mother laid out for him and their family. In honor of this, Ian established this scholarship as a tribute to his mom’s resilience to help other pharmacy students with financial need. And, by the way, Janet still continues to work at the age of 84. George H. Watt Memorial Scholarship honors the man who taught the first pharmacy class at Washington State College in 1896 and who served as one of the early chairs of the pharmacy department. The scholarship was funded from the estate of Mrs. George H. Watt. This scholarship was formally known as the WSPA Student Aid Trust Fund Scholarship, and further as the Washington Pharmacists Student Aid Trust Scholarship. It is now endowed and administered as the Washington State Pharmacy Foundation Endowed Scholarship in Pharmacy. The Washington State Pharmacy Foundation is dedicated to furthering the pharmaceutical professions and the quality of professional service to the general public. The foundation members have committed themselves to emphasize excellence in pharmaceutical and patient care and to promote professional growth, therefore they have established the Washington Sate Pharmacy Foundation Endowed Scholarship in Pharmacy. This scholarship has been established by the WSU College of Pharmacy and Pharmaceutical Sciences Class of 1965 for the purpose of furthering the pharmaceutical profession and to emphasize excellence in pharmaceutical care and promote professional growth. The Bracken Family Fellowship was established in 1995 by Sharon Lewis Bracken to support cancer prevention research at WSU. Sharon and her husband Jim owned and operated L.D. Bracken pharmacies of Seattle, started by Jim’s father, L.D. Bracken. Jim died of leukemia in 1984. The Erwin N. & Jennie L. Foisey Memorial Scholarship was established by funds from their estate in 1986. He graduated as a pharmaceutical chemist from WSC in 1926 and spent close to half a century working for Aubert Drug in Bellingham, becoming part owner of the business in later years. The Sue Harriet Monroe Mullen Graduate Fellowship was established in 1998 to support cancer research at the college. Sue Mullen was a 1928 WSC graduate in home economics whose father, brother and husband were pharmacists. Cancer claimed the lives of many of her family members – grandfather, father, mother, daughter, and four brothers. The James and Diann Robbers Student Research Scholarship was established in December 2007 by James and Diann Robbers, both from Everett, Wash. Diann graduated from WSU in 1957 with a B.S. in physical education and he graduated the same year with a Bachelor of Pharmacy, and then in 1961 with an M.S. in Pharmacy. Diann went on to to become a registered physical therapist and James obtained a Ph.D. and spent many years at Purdue University, as a professor in the department of medicinal chemistry. held by Professor John R. White, Jr. Proceeds from this fund will be used to create a scholarship to honor the life’s work and legacy of William, class of 1969, and Felicia Gaskins at WSU. William (Bill) and Felicia met at WSU in 1962 as undergraduates and married in 1964. Bill mentored and trained more than 300 WSU students who earned internship hours and clinical experience in the hospital pharmacy over a 43-year career. During her tenure at WSU Felicia was Senior Associate Director of the International Education Program, Director of the Conflict Resolution Program and Associate Vice President of Equity and Diversity.